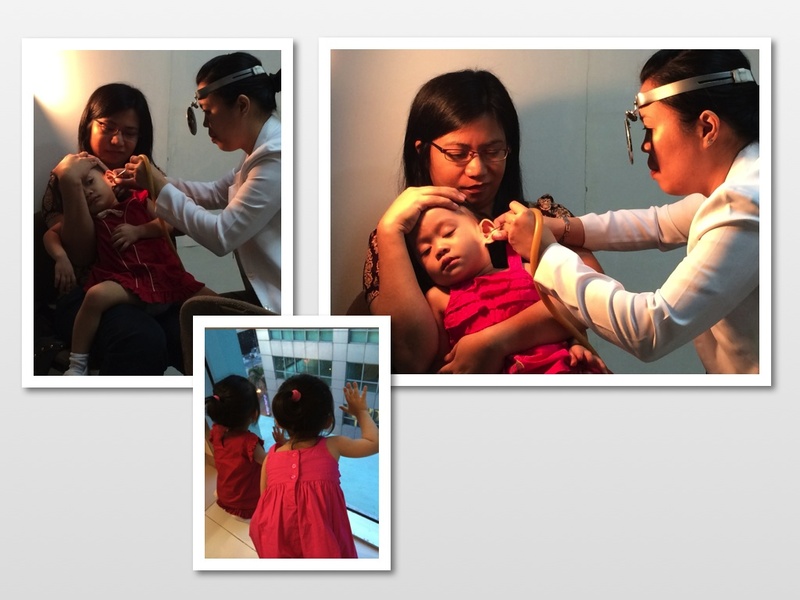 We were advised by our pedia that the twins’ left ears—yes, both twins, but only the left ear—have a build up of earwax and would need cleaning by an ear, eye, nose and throat (EENT) specialist. Apparently the ear drops that she first advised us to try was not enough and at least in one twin’s case, the earwax has become impacted. Ugh. That doesn’t sound good. Fortunately, it didn’t look like the twins were bothered by the earwax, so before things could get any worse, we decided to have the twins’ ears checked out by a specialist. I researched and made sure that we would go to a pedia EENT. Sure, any EENT specialist can perform the simple procedure of ear cleaning, but I wanted someone who’s really used to working with tiny ears attached to little people prone to literally jerking around and throwing their bodies up the air like one possessed when provoked, you know what I mean? I also needed to research for a specialist who’s accredited by our health card. 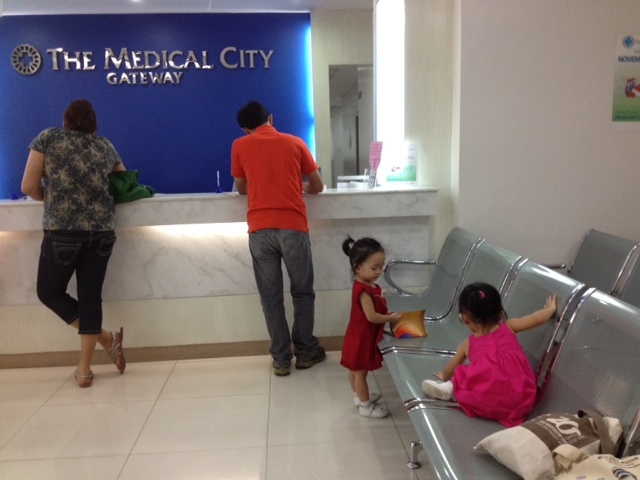 There were a few options, but because of convenience/proximity, we chose one who holds clinic at The Medical City Gateway. I checked and double-checked on the doctors’ clinic hours, then made sure again that she would actually be there on that day. A phone call made to the Medical City Gateway informed me that we couldn’t make an appointment but just walk in, making sure to bring our health card. However, I didn’t want to take the risk of hauling the twins over there only to find out that the doctor isn’t going to show that day, so what I did was get hold of the doctor’s secretary at the main Medical City hospital and get confirmation that she would indeed be going to Gateway that day. Most importantly, I talked to the twins and made sure that they knew what was coming. There have been times when the twins would even balk at stepping on the weighing scale at the pedia’s clinic, crying and screaming their heads off. But I’ve found that they’re old enough to understand and simply talking to them beforehand—the night before and again on the way to the clinic—would really help a lot. So for our most recent pedia visits, they knew that we were going to the clinic, they knew what would happen, down to the body parts that the doctor was going to check out (which, in a typical pedia check-up, would be at least the chest, back, eyes, ears, and diaper area for smaller babies). And lo and behold, there was considerably less fuss. The same thing happened at our EENT consultation. Before we left home, I explained to them that we were going to the doctor who’d look at their ears and clean them. At the clinic, one after another, the twins calmly sat on my lap as the doctor went about the steps of checking their ears, putting some eardrops to soften the impacted earwax, and finally using a compressor-powered suction to get the stuff out. It also helped that in between those steps, there would be gaps as the doctor prepared the things needed. During those gaps, the twins would scramble off my lap and join the other twin in checking out the view outside the window. When the time came to do the actual procedure, they obediently went on my lap again and stayed put, and did not even get bothered by the noise the compressor made. One twin did start to kick up a fuss at some point because she had the worse case and her procedure took longer, but it didn’t really take much to calm her down again. The doctor also remarked on their good behavior. Thankfully, the impacted earwax was removed successfully and pretty quickly (the doctor did not make any guarantees beforehand; saying that she wouldn’t force it should the earwax prove difficult to remove). And even now, I’m still amazed at how calm the twins were! 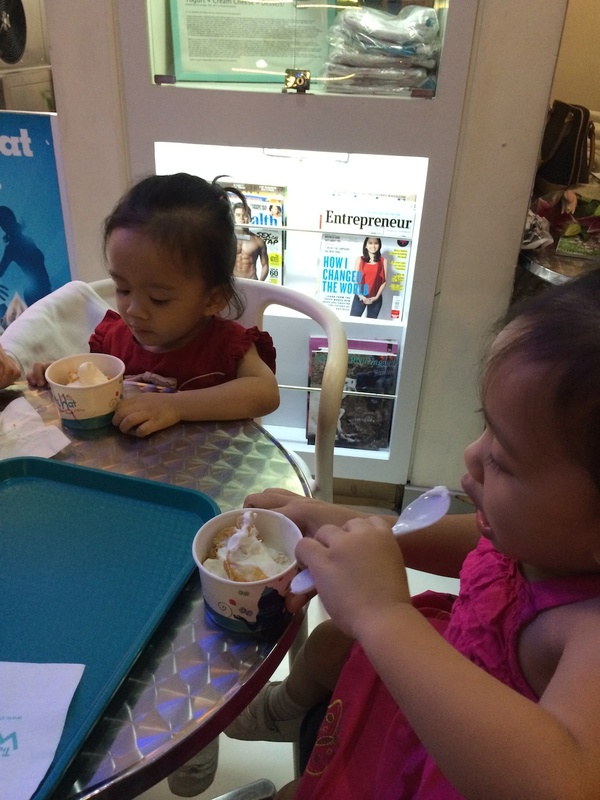 So after such a successful session, there was one more thing to do: reward the twins with frozen yogurt! Do not insert cotton buds, your finger or any instrument to remove your child’s ear wax. Dry your child’s ears after a swim or shower. Gently clean the outside of your child’s ear with a wet cloth. Our next challenge: first visit to the pedia dentist. Now that I think would be a little more challenging. Tips would be much appreciated! « The Twins Turn Two! It’s true that earwax come out on its own. I see this all the time with my 6month old baby. But I don’t remember it being so with my eldest though. I have a friend who always visit pedia EENT, she let the doctor remove his son’s earwax if the ear drop is not working. Thanks for the tips, my son has been complaining on and off about his left ear. Everytime i attempt for eent visit, he would say he is okay, only to complain again after. haha funny boy, biglang gumagaling pag pupunta na sa doctor! I had the same problem before and my elder daughter, too. Kainis lang pagnangyari yan. Nakakabingi kasi at makati. Yay.. ayaw ko na. Haha. medyo adik ako sa cotton buds so I’ve had a couple of full-blown ear infections before…..suuuuper sakit, I certainly wouldn’t wish it on our kids! It’s a good thing your precious girls are well behaved! Cute photos! I agree with you. Parent’s should not ignore clogged ears and they need to go to a specialist for that. Ears are very sensitive and when handled improperly, the kids may suffer long-term effects. exactly. not to mention an ear infection can be super painful. but shudders on the long-term effects! true! talking about it beforehand really made a difference! 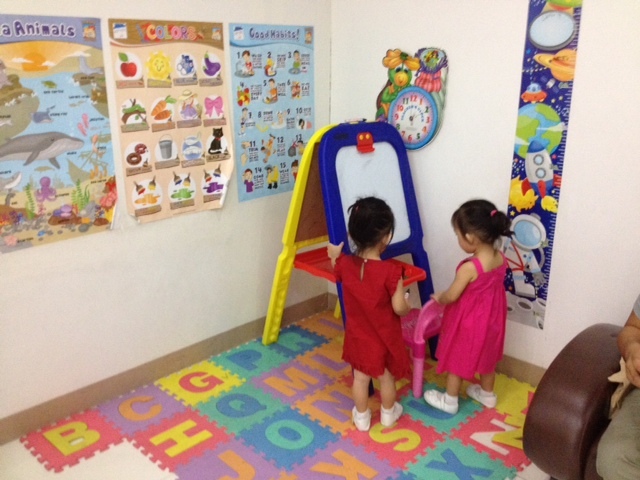 Our pedia hasn’t advised us to take my kids to an EENT but I’m thinking of taking them there for regular cleaning. My little girl is telling me kasi that her ears are itchy and I don’t want to poke ear buds into her ears. hhmm good idea about using photos of decaying teeth, ha ha! will try that, thanks! Awww good job! I think my kid would have squirmed so much. I think this is a common thing among children since I remember a niece of mine having the same issue. But hurray for the quick fix! Good girls! Happy for you sissy! They’re such good girls! We brought my toddler to tag along her 7 year old cousin who had a cleaning of her teeth done. At least, it’s step one to having his teeth cleaned by the dentist one day!